Industry Nine's Torch Series hubs offer less drag, amazing anodized color quality, and the lightness and quick engagement of a superior hub. The weight is approximately 150 grams lighter than the previous generation. The moment you see these hubs in person, it's easy to tell why i9 is known to make one of the best-looking hubs on the market. The 120 point, 3° engagement, 6 (2x3 alternating) pawl engagement makes for less drag and quicker engagement than most mountain bikers are used to. This quick engagement is ideal for cyclocross races, sprinting out of tight turns, and steep mountain climbs where a pause in your cadence flow equals a loss of balance and maybe a topple over! Large diameter disk flanges are angled to lower spoke stress, improve wheel stiffness, and braking torque transfer. The Torch utilizes a contact seal packed with marine grease just outside of the bearings to keep grime out of the cartridge bearing. This makes for less maintenance and serves to extend the life of the bearings. 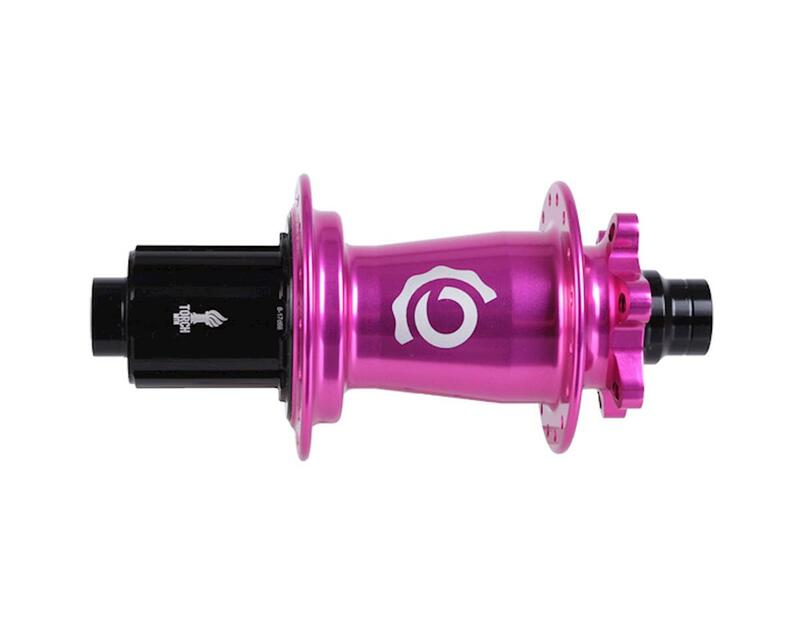 Industry Nine's Torch Series hubs offer less drag, amazing anodized color quality, and the lightness and quick engagement of a superior hub. The weight is approximately 150 grams lighter than the previous generation. The moment you see these hubs in person, it's easy to tell why i9 is known to make one of the best-looking hubs on the market. The 120 point, 3° engagement, 6 (2x3 alternating) pawl engagement makes for less drag and quicker engagement than most mountain bikers are used to. This quick engagement is ideal for cross country races, sprinting out of tight turns, and steep mountain climbs where a pause in your cadence can equal a loss of balance, a foot down dab and maybe a topple over! Large diameter flanges are angled to lower spoke stress, improve wheel stiffness, and braking torque transfer. The Torch utilizes a contact seal packed with marine grease just outside of the bearings to keep grime out of the cartridge bearing. This makes for less maintenance and serves to extend the life of the bearings.